Grace Church in Houston, Texas was the gathering point for worshippers to gather from around the world as ONE church in passionate pursuit of God's presence at the September 2009 Deeper Level Conference, hosted by world renowned worship leader, Israel Houghton. Already in its third year, A Deeper Level '09 Worship Conference brought together those who have a passion for a lifestyle of worship, including noted artists like Peter Wilson of Hillsong London, James Fortune, Micah Stampley, Tommy Sims, Kari Jobe, Melonie Daniels and Freddy Rodriguez. Guest speakers included Christine Caine of Hillsong Australia, Pastor Jentezen Franklin from Atlanta, and Pittsburgh's Bishop Joseph Garlington. As stated in the conference's goals, "our mission is to empower leadership, equip those involved in all areas of music and production, and to propel worshipers to. We will press into God as He ignites us with deeper purpose and restores, refines and renews vision for our lives to rise with power and shine before the world" and that we did! Each day opened with a general session where Israel Houghton and the New Breed team, under the direction of Daniel Johnson, endeavored to take us to a new place of worship. Several songs were ministered from the forthcoming New Breed album entitled "Generation Love" which was recorded live during Deeper Level '08. The afternoon classes and workshops included songwriting sessions, how to increase your vocal range, easy music theory, production and sound reinforcements, the visual worship experience and sessions specifically focused on women with a special luncheon held by Israel's wife, Meleasa Houghton. One of the highlights for was Thursday evening, when our attention was directed to the global church, as we traveled "Around The World" from the comfort of our seats in Houston, Texas. We were led into the presence of God by way of several worship leaders haling from the UK, South Africa, Indonesia and New Zealand. Respective flags from each country dressed the auditorium, helping to set the tone for this global worship experience. Conference attendees were reminded that we have indeed been called to the nations to spread His love and make disciples, a notion that Israel & New Breed have adopted from the very inception of their ministry with a sense of dignity, honor, humility and strength strength that comes from a sense of service, not status. GOSPELflava.com strongly recommends the Deeper Level Conference to those who are have a true passion for worship and who are looking for a dynamic, life changing encounter with God... But don't just take our word for it! Check out quotes, pictures and more from Deeper Level '09! I love the fact that the deeper level conference doesn't demand worship, it inspires it. 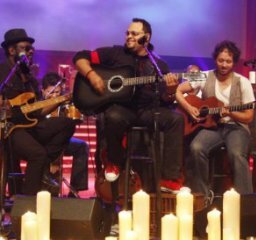 I loved Israel Houghton, Aaron Lindsay, Tommy Sims, Michael Gungor and Javier Solis throwing down on an acoustic set of the whole 'Power of One' album tonight...absolutely mind blowing! Hey everyone, make sure you experience Israel's conference. You will be so blessed, encouraged and well taught. It's great! A Deeper Level '09 has been absolutely amazing and life changing. I went in through the North gate and came out through the South Gate!!!! What an AMAZING conference! Israel, you are truly helping worship leaders and musicians, globally. GOD IS GOOD! Excitement is already building in Chicago about Deeper Level coming in 2010. Thanks for everything! Words can't quite encapsulate my experience at "A Deeper Level" this year. It was my first one, but I almost left feeling like I'd received the culmination of all three years of the conference put together. From the teaching, to the worship, to just all of the people who came with such hunger & expectation - it was nothing short of breathtaking. I'm going to need a minute to actually take it all in! God, once again, showed Himself so strong & faithful.